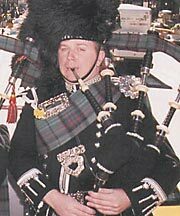 ScottishPower Tunes of Glory, New York April 6 2002. 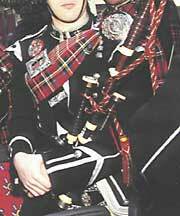 The piper is John MacLeod of the ScottishPower Pipe Band. Photo credited to Colin Dickson and Charles Orr, courtesy Pipefest.com. Used with permission. The full plaid—the piper's plaid—with it's flowing cape-like flair can create quite an impression, especially since it is typically worn with full military regalia—feather bonnet, cross belt, etc. But the plaid can be confusing to put on, not to mention difficult physically. Considering this garment requires wrapping around your body quite a bit, the easiest way to put it on is to have someone help you, but it can certainly be done by one person. Before you start, it will be quite helpful to view the pictures of plaids in their finished state, so you know what your goal is. Keep in mind, that a half plaid also exists—sometimes called a "drummer's plaid," but these instructions are for the full version. Lothian & Borders Police in New York for Tartan Day 2001, Photos by Colin Dickson, courtesy Pipefest.com. Used with permission. 1. Unbutton your the epaulet on your left shoulder and flip it open. Place plaid face up over your left shoulder starting with the closely stitched end falling in front of you about 6" below your waist. (If you are not the average sized piper, you will have to adjust the end in front of you up or down. Experience will tell where you, personally, have to start.) Make sure the pleats are facing toward you and not away from you. 2. Wrap the portion falling behind you around your back and under your right armpit. 4. The end of the open pleated portion of the plaid should be hanging at the top of your spats if you are wearing them, otherwise consider your target to be one quarter to one third up your lower leg. If the plaid is not, you will need to pull the plaid around your body one way or the other so that the end is properly positioned. 5. Pull on the the closely stitched end to tighten the plaid close to your body so that it is not loose, but not constricting. 6. Button the epaulet over the plaid. 7. Fold the end of the plaid that is hanging in front of you over the left epaulet—slightly to the outside—then down underneath the length of plaid that was already hanging at your back. 8. The closely stitched end which is now mostly hidden is slipped under the crossbelt and, if you have enough left, also under the belt at your waist. 9. Pull the pleat of exposed plaid closest to your left arm all the way around your left shoulder and to the front. Using a plaid brooch and with the first pleat remaining closed, pin the plaid to the chest-crossing portion of the plaid where it meets the shoulder. This point should be at least as high as the base of the left epaulet. Done correctly, the the plaid should drop from the brooch and around your shoulder to your back. Here's an example the position of the plaid relative to your legs. Yet another example of a properly positioned plaid. These two images courtesy Rick James. 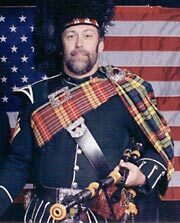 Chris Eyre has a good article, How to Make a Piper's Plaid . Since the time I wrote this article, another, Plaid Tying (PDF) , has appeared with some additional photos which may be helpful. If you suggestions for this page, please contact me. Page first created in September 19, 2002.